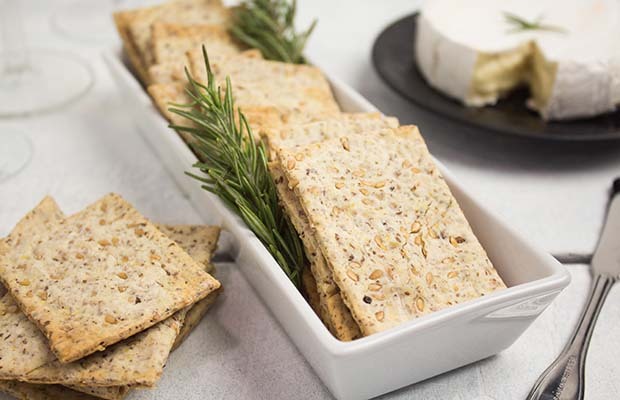 This is a very basic cracker recipe with several variations. In a bowl of a stand-up mixer, add flax seed, ground flax, flour, baking powder, salt and margarine or butter. With the paddle attachment, mix on low speed until the mixture resembles a coarse meal. Stir in milk and mix until mixture forms a soft dough. (You can also mix the dough by hand). Wrap dough in plastic wrap and chill 10 minutes. Divide the dough into quarters. Turn out onto a lightly floured board. Roll out very thin to a rectangle 1/16 inch (2 mm) thick. Cut into 2 1/2 inch (6 cm) squares. Transfer to an ungreased baking sheet. Repeat with the remainder of the dough. Bake 20 minutes until crisp and golden. Remove from sheet and cool on a rack. Onion: 1 Tbsp (15 mL) powdered onion soup mix. Cheese: 1 cup (250 mL) grated cheddar cheese. Italian: 1 Tbsp (15 mL) oregano and 1 cup (250 mL) grated mozzarella cheese. Serving Size: 1 – 2 1/2 x 2 1/2 inch (6 x 6 cm) cracker. Each serving contains 1 tsp (5 mL) of flax.